Success came the way of the host association on the second day of play, Thursday 25th August, at the 2016 Chinese Taipei Junior and Cadet Open; both the Cadet Boys’ Team and Cadet Girls’ Team titles were secured by home based players. Selecting from Tai Ming-Wei, Huang Hung-Chou and Huang Yan-Chen; Chinese Taipei ‘A’ secured the Cadet Boys’ Team crown; similarly Tsai Yu-Chin, Huang Yu-Jie and Chang Ju-Chia combined to strike gold in the Cadet Girls’ Team competition. Furthermore, both titles were secured in style. In the Cadet Boys’ Team event, just one individual match went astray; at the semi-final stage against Chinese Taipei ‘C’, Huang Hung-Chou experienced defeat at the hands of Huang Yu-Jen (11-7, 4-11, 11-5, 11-8); otherwise it was victory by the three-nil margin in each fixture. At the quarter-final stage a three-nil win was posted against the Malaysian outfit formed by Javen Choong and Chin Wen Jie, before in the final, the same margin of victory was recorded in opposition to Hong Kong’s Lau Chun Kit and Tsang Tsz Tsun. However, the contest was rather closer than the score-line may suggest, two of the three matches needed the full five games to determine the result. Huang Yan-Cheng beat Lau Chun Kit in a full distance duel (11-2, 6-11, 11-5, 9-11, 11-5), before Tai Ming-Wei defeated Tsang Tsz Tsun in four games (11-7, 8-11, 11-4, 11-5) and a doubles success recorded by Huang Hung-Chou and Tai Ming-Wei in five games (11-9, 6-11, 10-12, 12-10, 11-7) brought matters to an end. A silver medal for Hong Kong but it was almost nothing at all; at the quarter-final stage they had to recover from a two matches to nil deficit to beat a spirited Singaporean outfit comprising Gerald Yu Zong Jun and Beh Kun Ting. Lau Chun Kit experienced defeat at the hands of Gerald Yu Zong Jun (10-12, 11-6, 11-7, 11-13, 11-7), before Tsang Tsz Tsun was beaten by Beh Kun Ting (6-11, 11-5, 11-9, 14-12) to put the Hong Kong duo on the precipice of defeat. A four games doubles success for Lau Chun Kit and Tsang Tsz Tsun sparked the recovery (9-11, 12-10, 11-6, 11-7). Lau Chun Kit returned to the table to beat Beh Kun Ting (6-11, 12-10, 11-8, 12-10) to set the scene for Tsang Tsz Tsun to complete the recovery. He duly obliged, accounting for Gerald Yu Zong Jun in four games (11-4, 4-11, 11-8, 11-8). 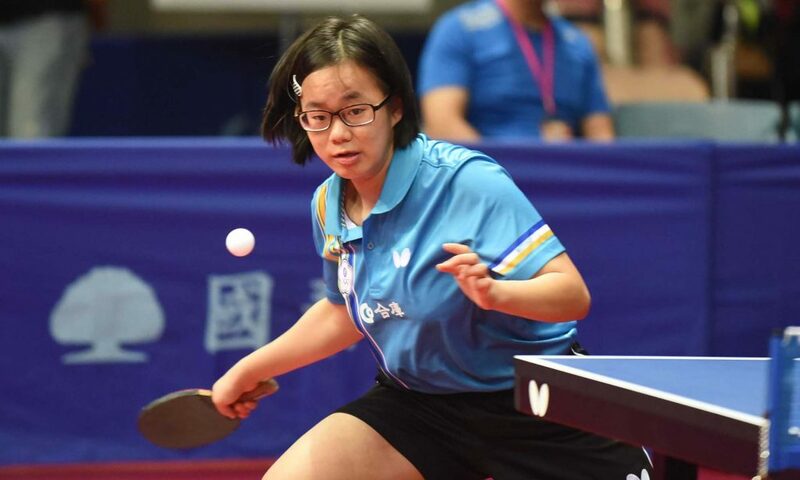 Likewise in the counterpart Cadet Girls’ Team competition there was just one individual match was surrendered by the Chinese Taipei outfit; also Hong Kong suffered in the final. The one errant contest was the defeat experienced by against Chinese Taipei ‘C’ in the semi-final round, when Chang Ju-Chia and Huang Yu-Jie experienced a four games reverse at the hands of Chen Ci-Xuan and Hung Ke-Shan (8-11, 11-5, 11-6, 16-14). A three-one win was the eventual outcome; a result that booked a place in the final where an impressive success was recorded against the Hong Kong ‘A’ Team duo comprising Lee Ka Yee and Wong Chin Yau. Tsai Yu-Chin gave the champions elect the perfect start by beating Lee Ka Yee (13-15, 11-3, 11-5, 11-5), before Huang Yu-Jie defeated Wong Chin Yau (11-7, 11-9, 11-7) and doubles success for Chang Ju-Chia and Tsai Yu-Chin concluded matters (11-9, 11-9, 11-13, 11-4). In the opposite half of the draw at the semi-final stage Lee Ka Yee and Wong Chin Yau had beaten the Chinese Taipei ‘B’ Team outfit formed by Chen Tzu-Ting, Cai Fong-En and Jhou Ting-Yu by three matches to nil. Matters concluded in the Cadet Boys’ Team and Cadet Girls’ Team events; attention now turns to the individual events. Play commences on Friday 26th August.